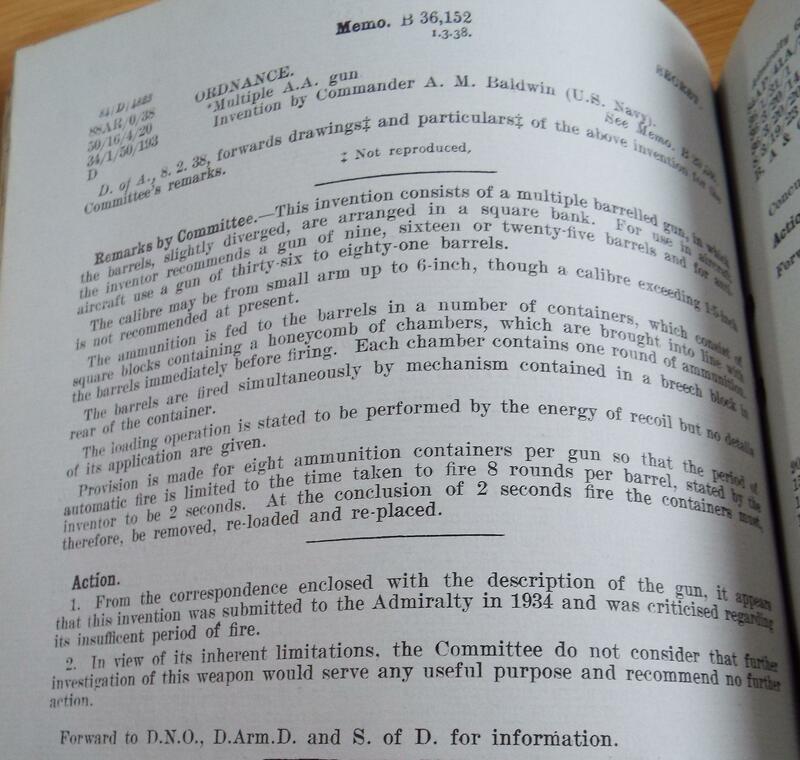 Cambric is normally used in ammunition design to contain gunpowder charges as it will contain the powder but allow a flash to penetrate. It does also not leave smouldering embers behind to ignite other things.. There is also a version of cambric, known as "primed cambric" which is cambric coated with a layer of fine meal gunpowder. It is used in pyrotechnics to carry a point ignition, say from a match head, across to a burning surface such as the end of a flare candle. These are all low explosive, pyrotechnic or propellent applications..
Kirkee of course being in India, the ambient temperature would result in the PE being in a Play Doh state..! Charisma: The ability to convince without the use of Logic. A founding member of the rapid car park construction (NI) association. On the Mk.II the Cambric bit is substantially increased so that it's the same size as the cone pretty much. Then it Vanishes on the Mk.III. I suspect its more to do with the type of filling, which is 808 for the Mk.I and II, and RDX for the Mk.III. You can see that the warhead is made as a steel pressed or spun cup which was filled from the front. The first thing that was added would have been the disk placed on the base of the cup on which was stood the CE Primer pellet/pellets. A doughnut of PE808 would then have been added around the pellets surrounded by a collar of Cambric. The remainder of the PE would then have been added inside the collar which would then have been folded in over the PE.. The copper cone and front fairing would then have been pressed in over the PE and Cambric collar, the collar preventing the PE being squeezed out between the lip of the cone and the edge of the cup. Getting PE in this area would be "really bad" as nitroglycerine in screw threads is seriously bad news.. The detcord/booster/fuze assembly would be added later, just before firing.. 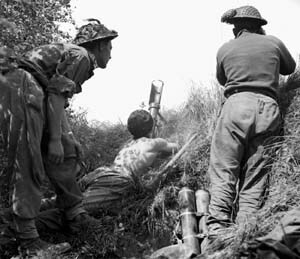 Interesting photo of the PIAT being used in the high elevation mode. A member of the Busted Knuckle Garage. We fcuk up things so you don't have to. I'll have to check that agaisnt the talk of how they filled them, but its good to hear a logical answer from an expert that makes sense. I think that's a range-finder. It seems to be mounted on a tripod and is facing the same direction as the Vickers in the background. Just a final update from the 16th Field Company, RCE war diaries. There are no mentions of the multiple PIAT launcher after that made in mid-Dec. After December, the engineers were involved in tasks linked to keeping the division mobile in the face of adverse weather/floods; and then in operations where, it seems, no opportunity for use of the PIATwerfer presented itself. I checked the period Dec 44 to June 45. From May onwards, the diaries are mainly concerned with demobilisation - related work. 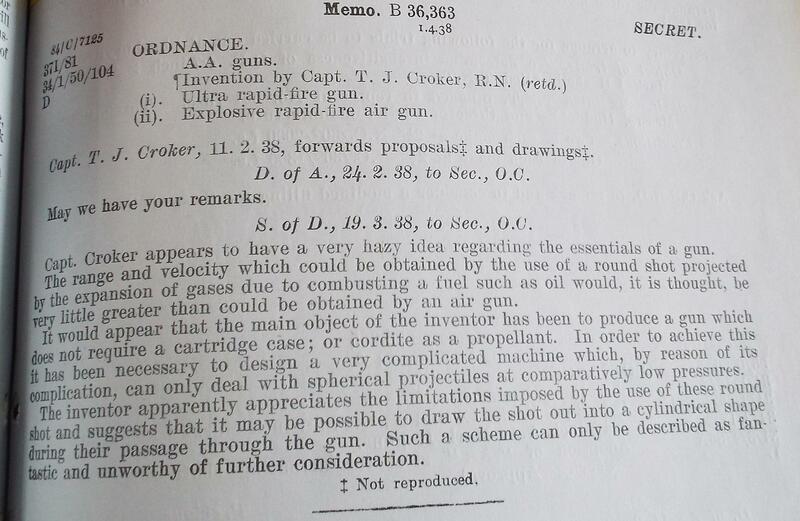 Interesting PDF on British grenades. Makes some reference to cambric. The Cambric appears to be drawn as a collar. As its rolled over the neck of the charge into the cone area the effective radius of the collar decreases and depending on the weave you can get pleats. These can take time to work out and there was probably a local production concession on allowing a certain amount to allow the assembly line to keep a certain speed. As to the effect of unever, poor fit of the cone liner to the charge I'll leave to the experts here. Time to recall my Primed Cambric story I think..
Primed Cambric is Cambric coated in gunpowder and is an essential part of many pyrotechnic natures. It was widely made in the past, however by the sixties, only one plant was making it in UK at ROF Glascoed in Welsh Wales..
All the UK ROF needs for Primed Cambric were being made by "Gwynneth" in the last hut up at the end of the ROF. There had been many making it in the past, but Gwynneth was the last in the line. The time came for Gwynneth to retire to her cottage up in the valleys..
From a 100% acceptance rate for Primed Cambric, none of the new production passed muster! All the UK pyro lines ground to a halt as did rocket motor production and a host of other strategic projects! Whatever Gwynneth Mk 2 was doing, it was wrong and resulted in 100% failure. RoF HQ became involved as did QE Woolwich and even The Fort, so you can see things were getting a bit desperate..! Eventually it was decided that they would have to recall Gwynneth to find out how she made Cambric. The directors limousine was despatched up the valley to Gwynneth's cottage to bring her back to the RoF. A meeting was convened in Gwynneth's old hut and the place was crammed (quite illegally) with management and scientists watching her every move..
Gwynneth then demonstrated how she dipped the strips of cambric in size (wallpaper paste), squeegeeing off the excess and putting the strips on wire racks. She then put the racks into an oven, closed the door, and sat down staring at the assembled crowd in silence. After some time she got up, opened the door of the oven and removed a strip, which she pressed to her cheek.. "Not quite ready yet" she announced, replacing the strip and sitting back down...! Nothing about "Gwynneth's cheek" in the spec! You can take a horse to water, but you can't make it drink. However, you can bl**dy well make it wish it had! Anyone who used a No 74 grenade in anger must have had HUGE gahooners. ..and it was allowed to get to two marks! (the second one had a bakelite sphere instead of a glass one).. I think the vast majority were issued to home guard and similar troops and were never used. Those that were I believe were used more for demolition and denial than for actual attack. That said, I can see they could be useful in built up areas if someone was stupid enough to take armour into those areas. The 74 was actually thrown out by the Ordnance Board when it was first developed.. It only got into production via SOE and other back doors. The OB was then in a position of trying to stuff the genie (or daemon!) back in the bottle.! The OB were really good at lobbing out weapons. To be fair having seen some of their proceedings when some new invention is suggested by its inventor you can see why (Exhibit A and Exhibit B). Our bloke Blacker got turfed out on his ear when he showed up with the Bombard. Now imagine if he'd not gotten the Bombard accepted, and the whole host of Spigot weapon systems we employed were never developed. Yeah, I think we can safely say the OB got that one wrong. PIAT practice shot finally arrived today. It's a dug up relic, but I'm one happy bunny! Top still unscrews! ...looks like the leg off a hospital bed to me! It's clearly been fired and lost. Got the top half of the cartridge still in it. The bottom half is definitely not there! Clapping and appplause at funerals. Is it appropiate.